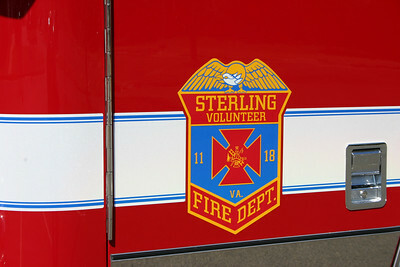 Sterling Volunteer Fire Department - Station's 11, 18, and 24. The following photographs are from Fire Station 18. 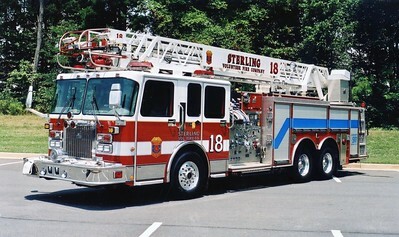 Sterling's Station 18 for Fire and Station 25 for Rescue - Loudoun County. 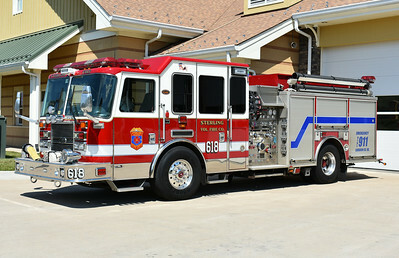 Sterling's Engine 618 is the newest of three Spartan Gladiator/Smeal's. 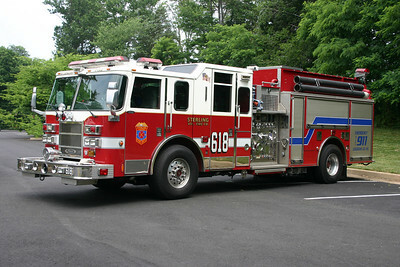 Engine 618 is equipped with a 1500/750/20 and carries Smeal number 617060. Engine's 611 and 624 operate similar trucks. 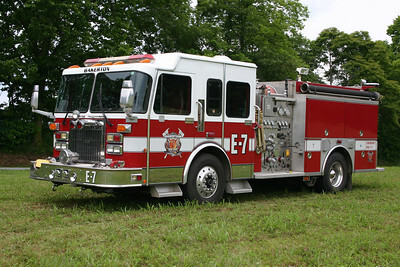 With Sterling's 2016 Spartan Gladiator/Smeal going into service as Engine 618, this 2009 KME Predator 1500/750 (GSO #7580) became Engine 618B in July of 2016. 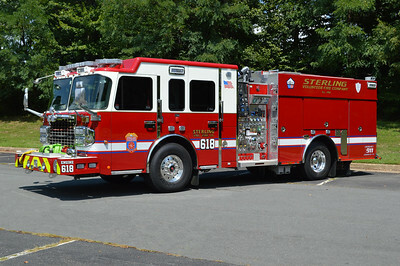 Another view of Sterling Fire's Engine 618B, a 2009 KME Predator 1500/750 with KME serial number GSO-7580. Photographed in June of 2017 behind Station 24. The officer side of Sterling's Engine 618, a 2009 KME. 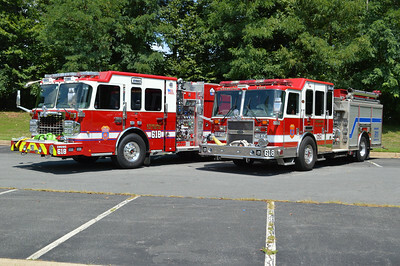 Sterling's Engine Companies from Station 18 - Engine 618 on the left (2016 Spartan Gladiator/Smeal) and Engine 618B on the right (2009 KME). Photographed in August of 2016. Sterling has operated three "Quints" during its history. 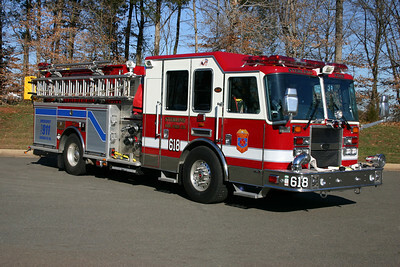 A quint is a combination ladder truck and engine company and offers a department flexibility in how the truck operates. Quint 618 in Sterling is a 2008 Spartan Gladiator/Smeal 105' rearmount and is also equipped with a 2000/500. It replaced a 2000 Spartan/Smeal 75' rearmount with a 1500/500. 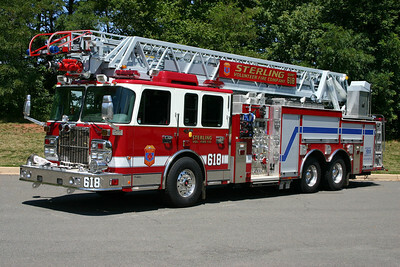 Sterling's Quint 618 also is a back up ladder truck when Tower 611 is out of service. Sterling, Virginia in Loudoun County has several homes in its first due located near the Potomac River, in a non-hydranted area. As a result, a tanker is assigned to Fire Station 18. Tanker 618 is this 2006 International 7600/2017 4-Guys with a 1500/3000 and Pierce job number F2499. 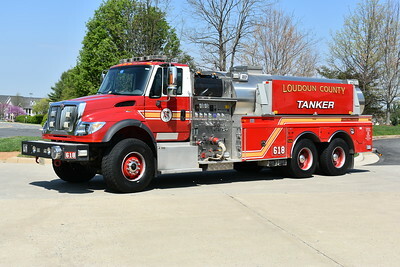 This tanker was originally assigned to Lucketts, Virginia Fire Station 10 in Loudoun, and later re-assigned to Sterling in December of 2016. Station 18 has a variety of different trailers. 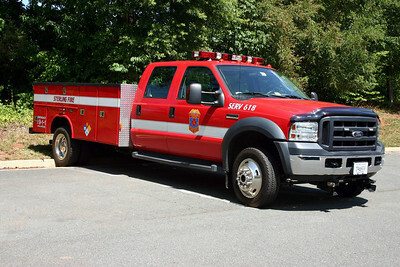 SERV 618 (Special Emergency Response Vehicle) is a 2005 Ford F550/Reading and is often used to pull the trailers . 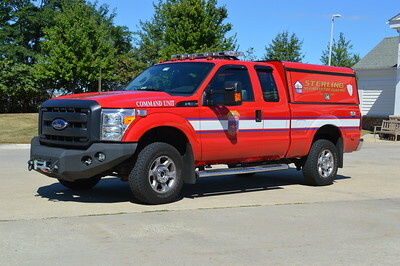 Sterling, Virginia Command 618, a 2014 Ford F350/FastLane. Originally Wagon 18, this Spartan Gladiator/Saulsbury 1500/750 was delivered in 1995. 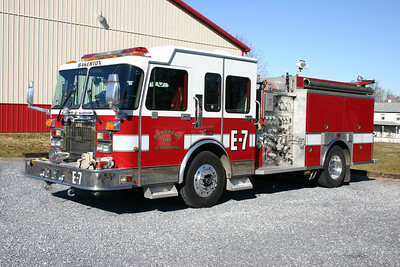 It was sold in 2009 and currently runs with the Bakerton, West Virginia FD. 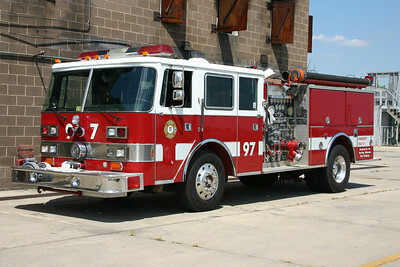 Former Engine 7 was this 1995 Spartan Gladiator/Saulsbury, 1500/750, sn- 295114. Sold to Half Moon, North Carolina. 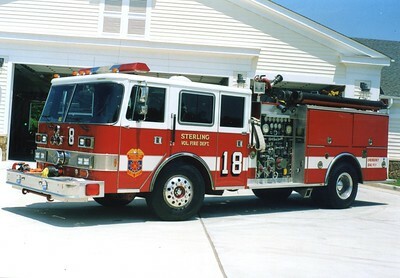 ex - Sterling, Virginia (Loudoun County) Wagon 18. Old Wagon 18 from Sterling now in service in Bakerton, West Virginia (Jefferson County), just outside of Harpers Ferry. Update - 2014 - Bakerton sold old Wagon 18 in late 2013 to Half Moon, NC which is located outside of Jacksonville, NC. 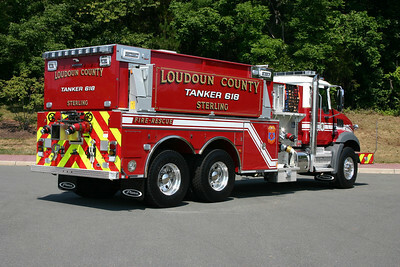 Tanker 618 was delivered along with Sterling's Engine 611, a 2004 Pierce engine. It carries 1,250 gallons of water and is equipped with a 1500 gallon per minute pump. 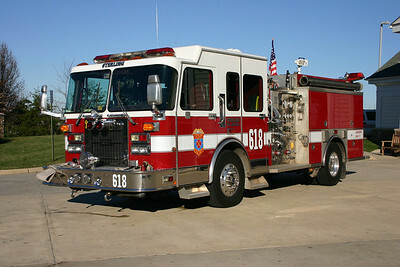 With the arrival of Tanker 618 (Mack/Pierce), this Pierce was listed for sale in June of 2011. 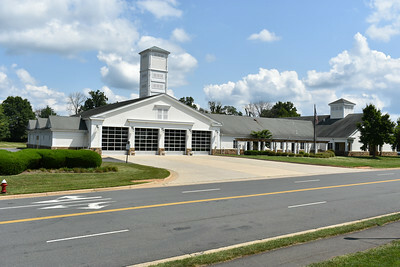 With the planned opening of the Kincora Safety Center (Fire Station 24) in 2013, the decision was then made not to sell this Pierce and it was assigned as Engine 624 when the new station opened. This unit was sold in 2015. 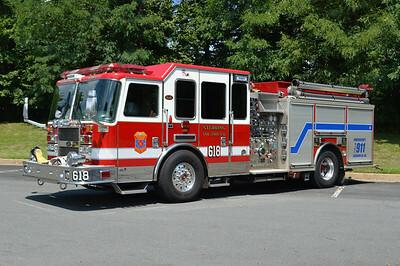 Former Quint 18, a 2000 Spartan/Smeal, 1500/500, 75'. Sold to Carter Fire Department (Dale, Indiana). 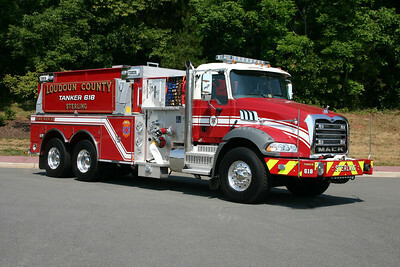 A twin to this truck operated as Quint 11 and was donated to the Great Capacon Fire Department in West Virginia. Sterling took delivery of this 2012 Mack Granite/Pierce 3,000 gallon tanker. Tanker 618 is also equipped with a 1500 gpm pump. Tanker 618 is the first Mack Granite tanker in the county. 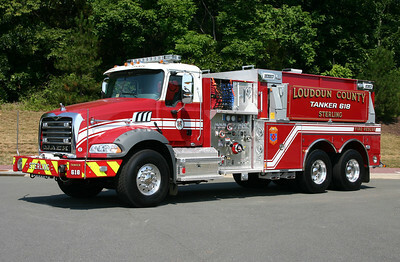 Photographed in July of 2012 at the fire and rescue warehouse in Ashburn just prior to being placed into service. Transferred to Fire Station 3 in Middleburg in 2015. The officer side of Tanker 618 as photographed in July of 2012. Transferred to Fire Station 3 in Middleburg in 2015. A back end view of Tanker 618. Transferred to Fire Station 3 in Middleburg in 2015. 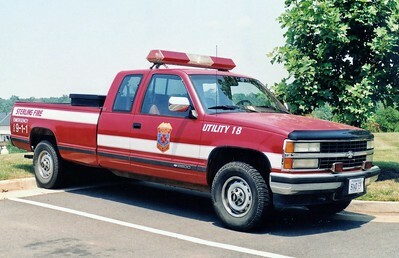 Former Utility 18, a 2002 Chevy 2500. 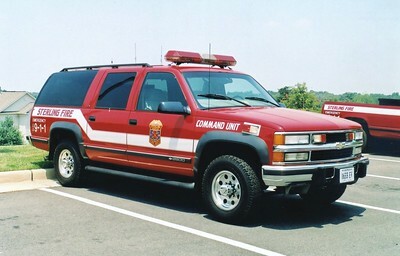 Former Command 18, a 1998 Chevy Suburban/Odyssey.